Natural health, beauty, and skincare are making a comeback, as it used to be the primary source of care in traditional, ancient times. As people began to create chemicals as a way to enhance things that already provided such powerful benefits, our society lost its interest in natural ingredients. Thankfully, the world has begun to develop a new love for the resources that our planet has provided for us, and our bodies are surely thanking us for it. There are so many natural, plant-derived oils that provide countless benefits for our body, skin, and hair; they can even make us look better, too. 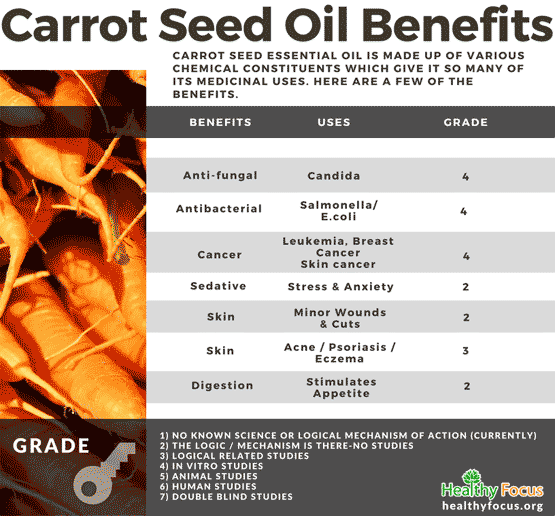 What is Carrot Seed Essential Oil? While it rarely makes any top ten lists of essential oils, carrot seed oil comes packed with a wide variety of medicinal benefits ranging from digestive benefits to skin nourishment. It should not be mistaken for the cheaper carrot oil which is an excellent base oil but lacking the range of therapeutic properties present in carrot seed oil. The oil has a distinctive earthy, wood-like fragrance and is usually a brownish yellow color. It has long been used in various parts of the world to treat a range of illnesses. In Chinese medicine, for example, carrot seed essential oil has been used to expel worms and to treat dysentery. It is important to separate carrot seed oil from its close sibling, carrot oil. Carrot oil is a common carrier or base oil, whereas carrot seed oil is an essential oil. Carrot seed oil is also harsher on the skin than carrot oil, which means that carrot seed oil should always be mixed with a carrier or base oil to allow for a more suitable topical application. Carrot seed essential oil is made up of various chemical constituents which give it so many of its medicinal uses. Its major compounds include a-pinene, b-pinene, camphene, myrcene, limonene, sabinene, geranyl-acetate and carotol. Carrot seed oil is also rich in natural antioxidants like vitamin A and carotene. Despite being underrated compared to many other essential oils, carrot seed comes with a very respectable range of medicinal properties that can help treat an array of illnesses. These properties include antiseptic, depurative, carminative, emmenagogue and vermifuge or antiparasitic actions. General Skin Health : Because it is rich in carotol, you can apply this essential oil to your skin to boost your skin’s appearance and health and to rejuvenate the cells. Carrot seed oil also helps to tone and tighten the skin. For Wrinkles : Carrot seed essential oil is high in natural antioxidants which can help combat the signs of aging like wrinkles and other age blemishes. Sun Damage : Damage fro the sun’s UV rays can wreak havoc on your skin and speed up the aging process. Applying carrot seed essential oil to the face and other parts of the skin can protect against sun damage and help rejuvenate the cells. To treat sunburn, dilute your carrot seed essential oil with some soothing aloe vera gel and apply it to the burned parts of your skin. While it may not be strong enough to act as a sun protectant on its own, it certainly provides powerful protection from ultraviolet rays that could be added to other natural ingredients to create a healthier alternative to store-bought, chemical sunscreens. Inflammatory Skin Conditions : carrot seed essential oil has excellent anti-inflammatory properties as well as antiseptic actions that may help treat several skin conditions including acne, rosacea and psoriasis. The oil has been primarily researched and praised for its ability to fight bacterial and fungal infections. It has proven effective against a range of bacteria and fungi many of which are common in the developing world. The infections for which carrot seed oil has proven effective include the following. Salmonella : Salmonella is a common foodborne sickness that affects around a million people a year in the US alone. It causes fever, stomach cramps, and diarrhea. Stenotrophomonas maltophilia : This is a rare strain which usually appears in hospitals and similar environments. Infection is rare but is possible in patients with a weak immune system including cancer patients, cystic fibrosis patients and people undergoing immunosuppressive treatment. Because of its potent antiseptic properties, you can apply carrot seed essential oil to minor grazes, scratches, bites and minor wounds. It can help prevent bacteria from taking hold and causing secondary issues. Please note that undiluted essential oils should never be applied to open wounds and it should only be used to treat and cleanse minor injuries. Carrot seed essential oil may also help to detoxify the body including the blood and internal organs helping them to work more efficiently. This essential oil might also help to regulate the secretion of bile from the liver and even to treat liver infections. One of the traditional uses of the oil was to treat jaundice. It also has diuretic properties and may help eliminate toxins from the blood. According to traditional use, carrot seed essential oil can help to cleanse the blood and eliminate the build-up of toxins such as uric acid from the bloodstream. This can help treat conditions such as gout or arthritis. According to laboratory studies, carrot seed oil may be one of many natural products with a potential role to play in the fight against cancer. Laboratory tests done so far have confirmed that carrot seed oil is effective against colon cancer, breast cancer and leukemia. (5) (6). Carrot seed essential oil can help provide some relief from the pain women suffer during menstruation. The oil also has emmenagogue properties meaning that it can help women suffering from irregular periods. Carrot seed essential oil is possibly undervalued in terms of its ability to treat the mind. It is however often used by aromatherapists to help treat people suffering from stress and anxiety. Its earthy aroma is not everyone’s cup of tea but some people respond very well to it. Like other essential oils used for emotional health, you may not find that it works for your particular problem. There is certainly nothing to lose from trying and potentially everything to gain. Try inhaling your carrot seed oil directly when you feel the need or diffusing it at home throughout the day. 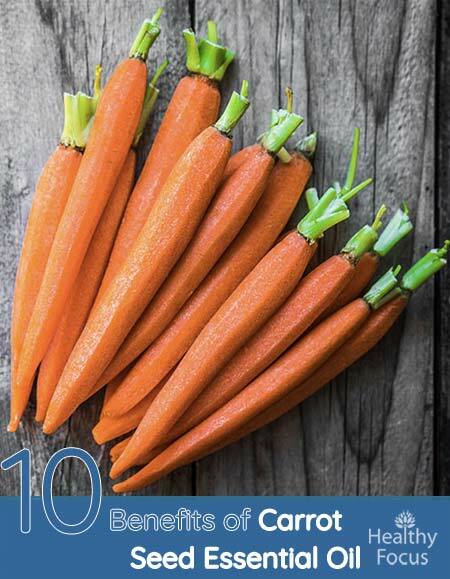 Carrot seed essential oil can also be used to boost your digestive system in a variety of different ways. It can help to stimulate the appetite which is useful when recovering from illness. It can also help eliminate bloating and gas and even ease hiccups. Carrot seed essential oil has vermifuge properties meaning that it is deadly to various certain parasites and worms. You should not take carrot seed essential oil internally unless you are under an expert’s supervision. Essential oils are extremely strong and the risk of side effects from consuming them is real. It can also kill the larvae of the mosquito Aedes albopictus, whose bite can spread yellow fever, dengue fever, Zika, and many other serious diseases. As well as being used as a tonic for the skin, carrot seed essential oil can also be applied to the hair. If you have dull looking or unhealthy hair, try applying some carrot seed oil every now and again. It can improve the health and appearance of your hair and bring it back to life. You can add a few drops of carrot seed oil to your regular conditioner and use as normal. Carrot seed oil also contains many powerful antioxidant properties, which can help fight diseases, protect the liver, and fight free radicals that could damage the cells and cause oxidative stress. The oil is also commonly used in skincare and beauty products. Although scientific research has yet to be done in these areas, many people have used the oil for moisturization of both the skin and hair. It has also been used to treat boils, ulcers, and abscesses, but research is still necessary for these benefits as well. The use of carrot seed oil also provides many other benefits that have been proven over centuries of use, since the medicinal and cosmetic practices of ancient times. The oil is commonly used for women to help treat painful menstrual symptoms and help encourage the production of breast milk following childbirth. Carrot seed oil could also help stimulate the appetite, stimulate the lymph system, treat liver and gallbladder disorders (such as hepatitis, enteritis, and colitis), as well as treat hiccups, flatulence, and colic. Cosmetically, the oil is often used to help moisturize and tighten the skin, leaving it refreshed and rejuvenated. Carrot seed essential oil blends very well with many other oils including cinnamon, lavender, juniper and geranium. It also blend well with citrus oils like lime, lemon and bergamot. There are plenty of ways to use the oil depending on the condition you are trying to treat. Inhalation : You can inhale this essential oil directly from your hands or a handkerchief in order to bolster your mood. Diffuse : Diffusing carrot seed essential oil in your home or office is a great way to relieve anxiety or stress and to help you focus. Topical Use : Dilute your carrot seed oil in a suitable carrier oil then apply it to the skin to deal with bloating, cramps or painful menstruation. Bath Soak : Add 5 or 6 drops of carrot seed essential oil to your bathtub, sit back and let its goodness wash over you. Comedogenic ratings are given to help people determine what specific natural substances they should choose that are suitable for their skin types. These ratings are given from a scale that ranges from 0 to 5, and the lower ratings are given to represent substances that should not cause negative effects on any skin type. The lower-rated substances are called non-comedogenic, and they shouldn’t clog your pores or worsen skin conditions such as acne. Of course, everybody’s skin is different, so you might still have a negative reaction to a so-called non-comedogenic oil, and you might not have a bad reaction to a so-called comedogenic oil. Carrot seed oil has been rated rather high on the comedogenic scale, given a rating of a 3 or 4. Due to its high amounts of oleic acid, this oil is likely not suitable for people who have skin that is prone to acne or other similar skin conditions. If you do have acne or sensitive skin, you should use the essential oil version instead and mix it with a carrier oil to dilute it. With that said, you should always try a patch test on a small area of your skin first, to see if you might still have a bad reaction to the application. Before adding carrot seed oil to your daily skin or hair care routines, it’s important to keep a few things in mind. First, you should always dilute carrot seed oil with a carrier oil due to its harshness and high comedogenic rating. Common carrier oils you could use include babassu oil, sunflower oil, almond oil, or hemp seed oil. If you feel that your skin may not react poorly to the oil by itself, you could try a small patch test to see how your skin reacts; if you do experience a reaction, diluting it with a carrier oil should fix the problem. Although carrot seed oil has been determined to be nontoxic, it still should not be used by women who are pregnant or who are trying to conceive. Essential oils, in general, should never be used by people who suffer from epilepsy, as these oils could overstimulate, which could lead to very severe reactions. Otherwise, the oil is generally known to cause very few side effects, but it could potentially increase the risk of developing a sun sensitivity due to the high amounts of furanocoumarin found in the oil; it may also potentially cause other symptoms of hypersensitivity, as well as occupational dermatitis. Carrot seed essential oil is regarded as safe for external use so long as it is properly diluted first. It should not be taken internally. Potential side effects of consuming carrot seed essential oil include nausea, vomiting and even convulsions. Do not apply this essential oil to your skin without first diluting it with a carrier oil. There have been reports of the wild carrot seed plant causing photosensitivity in some people. While the essential oil is not thought to cause the same problem, you should be careful when exposing your skin to the sun in the first 48 hours after applying the oil. If you experience an adverse skin reaction, stop using the oil straight away. To be safe, you should always speak with your doctor before adding carrot seed oil to your daily skin or hair care routines. You might also work with an experienced holistic practitioner to make sure that your treatment is done properly, as an overdose of carrot seed oil could cause convulsions or vomiting. However, if you use the oil safely, it can provide many benefits. As with any other form of treatment that hasn’t been prescribed by a doctor, be careful, do your research, and get a professional opinion to ensure that you won’t make anything worse or cause any new issues.